Imagine a place deep beneath the ocean surface where giant underwater avalanches coat the seabed in layers of muddy sands. An enormous fault – a tectonic plate boundary – exists where two sides of the ocean are being forced together, only one side to survive. Here, ocean floor is being consumed by the Earth, subducting below the surviving plate to the east. As it sinks, solid rock is melted beneath the eastern plate before rising to the surface where it creates an island arc and fuels a series of active volcanoes. As the process continues, the convergent boundary pulls a continent closer and closer to the subduction zone. When it reaches the edge, the continent isn’t pulled beneath. Instead, it crashes into the volcanic islands, melding the two into one with such forces that solid rock is bent and folded, the minerals within them realigning into new positions without ever having to melt or break the rock. The process continues. The volcanoes rage on along the eastern seaboard of the continent and subduction continues, pulling a micro continent from the east. Again a collision occurs, forever closing the ocean between the two land masses. The continent grows larger still. Massive earthquakes and volcanic eruptions plague the region. Rocks deform and metamorphose into completely new types of rock. As if this weren’t enough, it all happens yet again, forming the largest continent ever to exist may well have created the highest mountain peaks the world has ever known, certainly rivaling the precipitous Himalayas. This place is very real. In fact, at least eight major cities are located here, including the Nation’s capital. These events all happened along the eastern seaboard of the United States over the last 510-300 million years. Since the final collision between 310-300 mya – the formation of Pangea – activity of this type died off in the region. Instead of mountain building collisions brought on by convergent boundaries, the lithosphere began to split and spread apart, creating a young Atlantic Ocean. Over the next 300 million years, the majestic Appalachian and Allegheny Mountains would be eroded down to their roots, leaving us with the present day ranges we are used to seeing today. 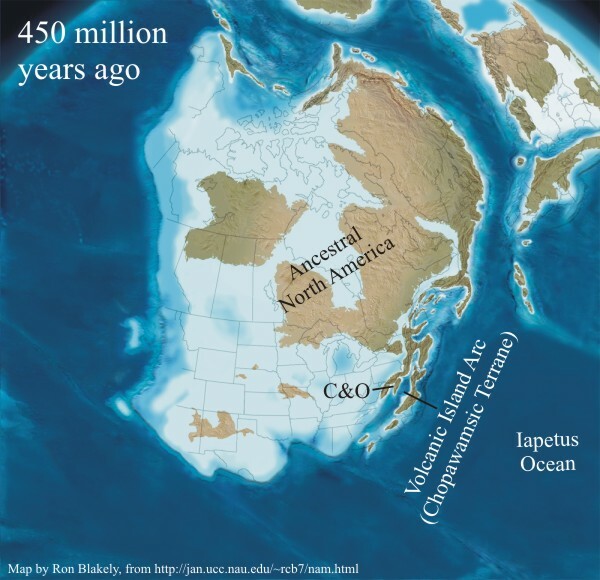 North America as it looked 450 mya during the onset of the Taconic Orogeny. The “C&O” refers to the Chesapeake & Ohio Canal that existed alongside the Potomac River in the area of Great Falls. It is in the middle of all this where present-day Great Falls National Park resides. 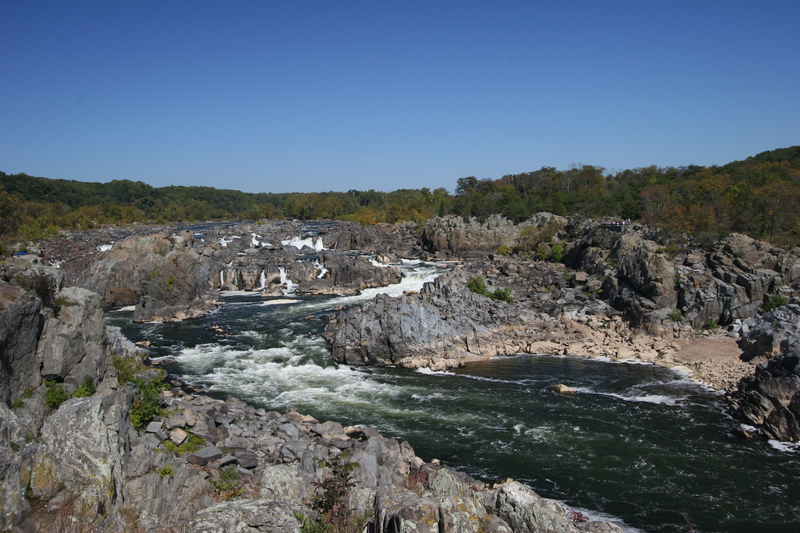 A side trip during my recent stay with relatives in Virginia, Great Falls is located about 15 miles outside of Washington, D.C. Most of the rocks here formed deep beneath the surface of the ancient Iapetus Ocean over 500 million years ago (mya). Remember the giant underwater avalanches? These “avalanches” are called turbidites, and are composed of a mixture of differently sized sediments which “flow” down a continental shelf – or in this case the submerged sides of our volcanic island arcs – and are deposited as a blanket over the deep ocean floor. When these sediments lithify (become rock) they are a type of “dirty” sandstone called a graywacke (“dirty” because there is a lot of silt and clay mixed in with the sand). At the time of our first collision between the ancestral North America and our volcanic island arc (about 450 mya during the late Cambrian) the graywacke that formed on the ocean floor was not actually subducting beneath the eastern plate and volcanic island arc with the rest of the oceanic crust. Instead, the non-subducting plate acted as a bulldozer scraping the top layers (mostly graywacke) off and forming what is called an accretionary wedge, which was later trapped between the ancestral North American continent and the island arc as they collided. Throughout this collision, referred to as the Taconian Orogeny (an “orogeny” being a mountain-building process), and the subsequent Acadian and Alleghany Orogenies, the graywacke was metamorphosed into meta-graywacke. This means that the pressures and temperature were such that the minerals in the rock were rearranged from a random alignment to a preferred orientation, giving the rock a “fabric”. During this process, the rock never melts (which is a pretty neat trick when you think about trying to accomplish this yourself). In addition, they are deformed into bends and folds that seem impossible to create without breaking the rock, but given enough time (millions of years), it can been done. Of course, the graywacke was not the only rock type caught up in all this. In the mix were also granites and oceanic shales (metamorphosed to gneiss and mica-rich schists, respectively), all present within the park. All this and we still haven’t come to why the park is named Great Falls. At some point in the past, likely around 300 mya, rivers began to establish drainage paths off of the ancestral Appalachians. The Potomac River chose a path eastward, feeding into Chesapeake Bay and the Atlantic Ocean. Today, the Potomac winds its way from Cumberland, MD to Washington D.C., taking it right through Great Falls Park. Here, the park’s namesake waterfalls are a series of falls up to 20 feet high. This might not sound impressive, but the park makes up for it in dropping about 76 feet in elevation over the course of under a mile, making the Great Falls of the Potomac the steepest fall line rapids of any river in the eastern United States. Additionally, the Potomac above the falls can reach over 1,500 feet across. Once downstream of the falls, the river rapidly decreases in width to 100 feet or less as it passes through Mather Gorge, which boasts near vertical cliffs on both sides of the river, creating a very straight mini canyon as the river progresses toward the sea. 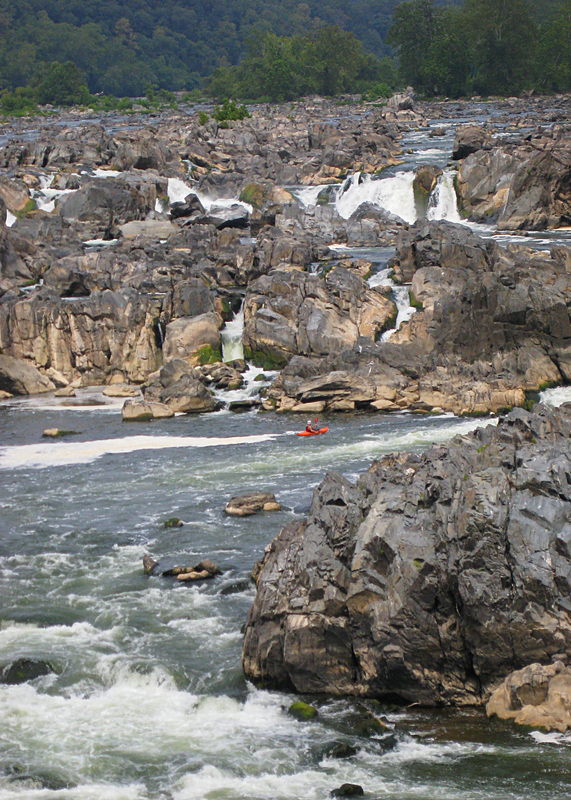 The rapids at Great Falls attracts kayakers from all over. There’s a reason Mather Gorge is so straight and narrow. As we all know, water flows downhill. In nature, a river will flow downhill until it reaches sea level. It does this by eroding the rock and sediments that travels across, many times “down-cutting” into the rock to form valleys. 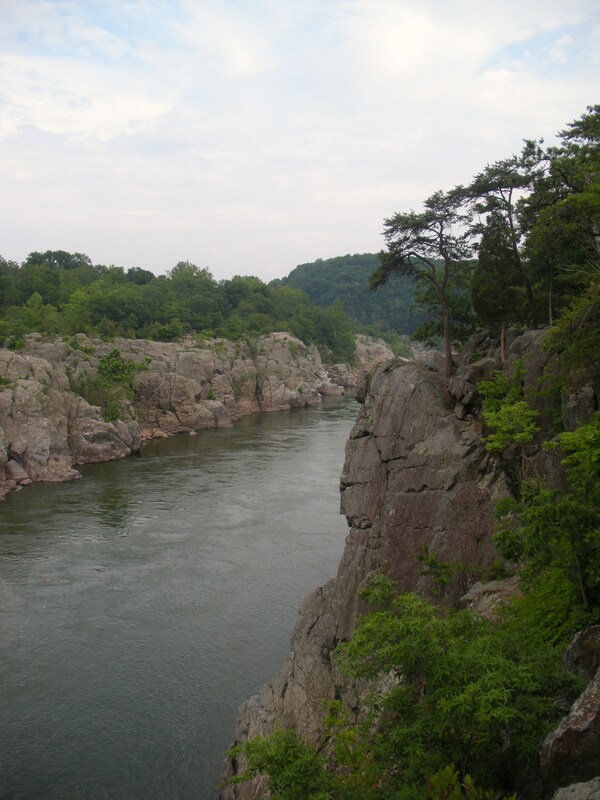 The Potomac River accomplished this through the hard metamorphic rocks in the region by finding weak points: faults and fractures. Mather Gorge is thought to be so straight because of an ancient fault line running down the center of the gorge, now hidden by the river. The crushed rock that would exist along this boundary would be much easier for the water to erode than the surrounding, more competent rocks. This resulted in the rapid down-cutting and the present day gorge. A section of Mather Gorge, looking south from west bank. For scale, a park visitor stands at top of east bank, about center (if you look hard enough). At over half a billion years in the making, the scenery at Great River Falls National Park is a sight to behold. Certainly, something with such an impressive history may not be expected by most visitors. Even for myself, it is amazing to look at such a sight and truly grasp the idea that the rocks here were originally formed in the abyssal plains of an ancient ocean, only later to be part of some of the tallest mountains to ever exist. But to those that do know the story of this region, it makes a visit here all the more exciting.